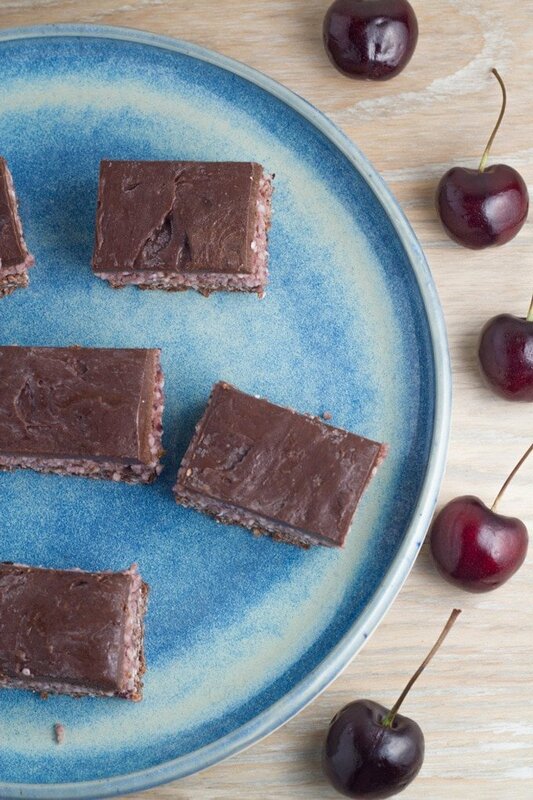 Raw Cherry ripe slice. Inspired by the popular chocolate bar but SO MUCH HEALTHIER and really tasty too! Also includes nut free base option. I used to be a big fan of store bought chocolate and desserts that you can buy from the patisserie or bakery. However these days, I much prefer to make my own sweets. And to be honest with you, I think they taste so much better and they are much healthier, which is a big win. 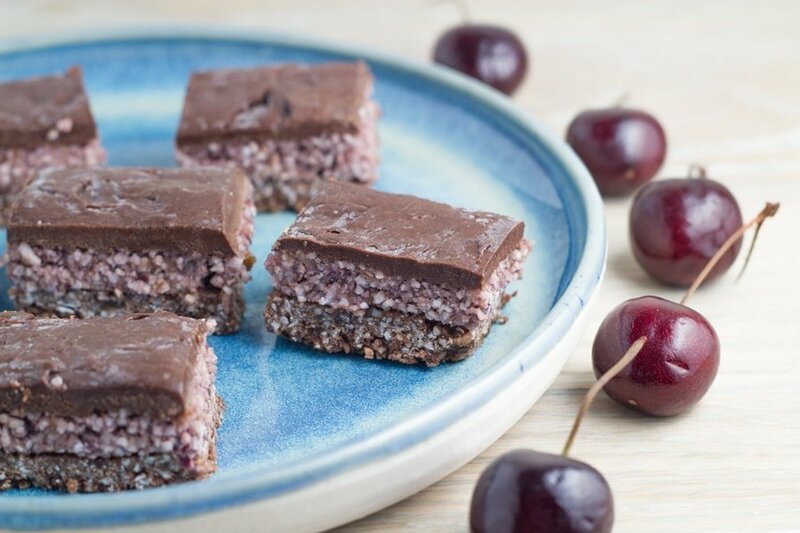 This cherry ripe slice was inspired by the popular chocolate bar that I used to have a long time ago! However my healthy version is gluten, dairy and refined sugar free, making it also suitable for vegan and paleo.This recipe suggests using cacao butter, which is delicious, but pretty expensive. Thankfully, so far it seems like a little bit goes a long way. However, you can substitute cacao butter with coconut oil if you don’t have cacao butter handy. 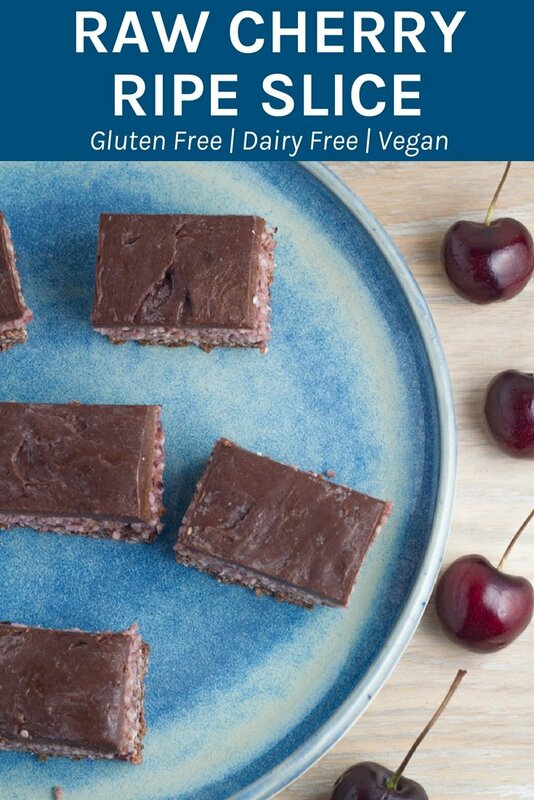 Over the past 18 months, I have created a bunch of amazing recipes that will make it easier for you to avoid buying store bought chocolate or patisserie sweets, including my raw chocolate raspberry slice, raw caramel slice bites, coconut rough, raw bounty slice, best ever caramel brownie slice and this Raw Cherry Ripe Slice. I have also recently updated this recipe to include a nut free base option. To make the base; place all base ingredients in a food processor and process until well mixed and the macadamias are crushed. Firmly press with the back of a spoon into a lined tin and place in the freezer. To make the center; place all of the centre ingredients into the blender and blend until smooth. Spoon the mixture onto the base. Place back into freezer and let set for at least 30 minutes. To make the chocolate topping, melt the cacao butter in a double boiler on low heat (I highly recommend shaving or chopping the cacao butter into smaller portions before adding to the double boiler). Add the organic maple syrup to the double boiler and whisk until combined. Whisk in the cacao powder. When well combined pour over the centre. Put back into the freezer and let it set completely (around 1 hour). Remove from the tin, slice straight away and store in an airtight container in the fridge or freezer (I recommend the freezer as it keeps the slice really firm).